Exeter centre Henry Slade has set his sights on a place on England's tour of Australia next summer as he recovers from a broken leg. The 22-year-old suffered the injury in the win over Wasps earlier this month and is likely to be out until March, ruling him out of the Six Nations. "At the minute I'd just like to get back fit and be playing for Exeter. "Then if I get selected in the summer to go to Australia that would be awesome," Slade told BBC South West. Slade was named Premiership Young Player of the Year in May and went on to make his England debut against France three months later, before featuring in their final World Cup match against Uruguay. He helped Exeter to their highest-ever Premiership finish last season when they came fifth to narrowly miss out on the play-offs and they are currently second in the table this term. 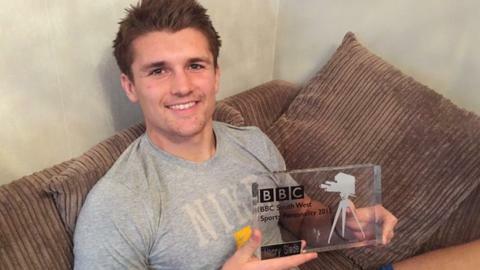 "I've really enjoyed my last few seasons here at the Chiefs, we've been going from strength to strength," added Slade, who has been named 2015 BBC South West Sports Personality of the Year. "It's just been a really big team effort and I'm obviously disappointed not to be part of it at the minute, but hopefully I can get back fit and rejoin the lads again."